As the top performing mid cap blend mutual fund, this Keeley Small-Mid Cap Value Fund has a small assets of $197 million. Its fund objective is to provide capital growth. The mutual fund utilizes its assets to purchase common stocks of companies with small and mid-size market capitalization, which is currently defined as $7.5 billion or less. The fund managers are John L .Kelly Jr. and Brian R. Kelly. It also has 1.40% expense ratio. This mid cap blend fund has a portfolio turnover rate of 51%. For 2012, the YTD return is 29.69%. Morningstar ranks it with 2 stars and neutral rating. You can buy the mutual fund with $2,500 through online brokerage. It current dividend yield is 0.22%. This class A fund has 4.50% sales load. The shares price is $13.30 (1/6/2013). As of November 2012, the top 3 stocks are Generac Holdings Inc, Comverse Technology Inc, and KB Home. The top 3 sectors are industrials (31.33%), consumer cyclical (23.36%), and financial services (18.53%). The Fidelity Leveraged Company Stock Fund uses its assets to invest in common stocks of leveraged companies. This no load fund has 0.94% yield. The minimum initial investment is $10,000. Its expense ratio fee is 0.85%. For 2012, this fund has year-to-date return of 28.82%. Managed by Thomas T. Soviero since 2003, It currently has Silver rating. This top performing mid cap blend mutual fund has 52-week range of $25.99-$33.15. The top 2 holdings are LyondellBasell Industries NV, and Service Corporation International Inc. If you invest $10,000 in this fund 3 years ago, your capital would have grown to be $14,373. It is available from 75 brokerages. Fidelity Value Strategies Fund invests mainly in stocks of undervalued midsize companies in the marketplace. It has $1.07 billion of assets. The distribution rate is 0.60%. Ranked with 2 star rating, it has returned 14.37% over the past 3 year, and 8.56% over the past decade. The fund’s NAV is $32.54. This Gabelli Focus Five Fund is a 3 star rating mutual fund. In 2012, it has YTD return of 23.61%. The equity fund can be bought with $1,000 initial investment. Its expense ratio, which is considered high, is 2.01%. It also has a front end sales load of 5.75%. The yield is 0%. The other classes of this domestic stock fund are Class AAA (GWSVX), Class C (GWSCX), and Class I (GWSIX). 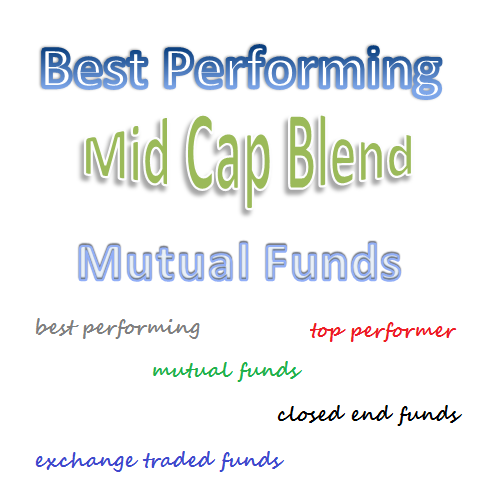 Based on load adjusted returns, this top performing mid-cap blend mutual fund has returned 12.94% over the past 3 year, and 3% over the past 5 year. The 3-year beta risk is 1.25. As of October 2012, the top 5 stocks in its portfolio are RealD Inc, Dana Holding Corp, CIT Group Inc, Brink’s Company, and EchoStar Corp.
Dreyfus MidCap Core Fund is available through 107 brokerages. It has only $100 million. The mutual fund invests in companies included in the S&P MidCap 400 Index or the Russell Midcap Index. The expense ratio is 1.30%. The holding turnover rate is 99.5%. It has investment style of Mid Value. As of November 2012, the fund is closed to new investors. The top 4 holdings are HollyFrontier Corp, Rayonier Inc, ResMed Inc, and Alaska Air Group Inc. It ranks with 2 stars rating. The fund YTD return is 23.45%. The Huntington Situs Fund objective is to seek long term capital appreciation. It invests majority of its assets in equities of companies whose geographical, political and/or demographic situs positions them to outperform other companies. The expense ratio is 1.57%. There is no yield. The portfolio turnover rate is 18%. B. Randolph Bateman is the fund manager. 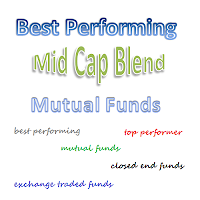 Ranked with 3 star rating, this top performing mid-cap blend mutual fund has returned 12.88% over the past 1 year, 13.77% over the past 3 year, and 10.39% over the past 10 year. You can buy the mutual fund with $1,000 initial funding.